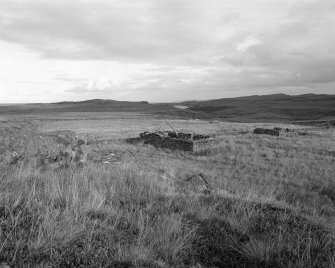 "...a fuming dunghill removed and fresh piled up again, and pretty near the same in colour, shape and size." Edmund Burt, writing his Letters from a Highland Gentleman in the 1720s, had no time for the turf-walled thatched houses of the Highlands. 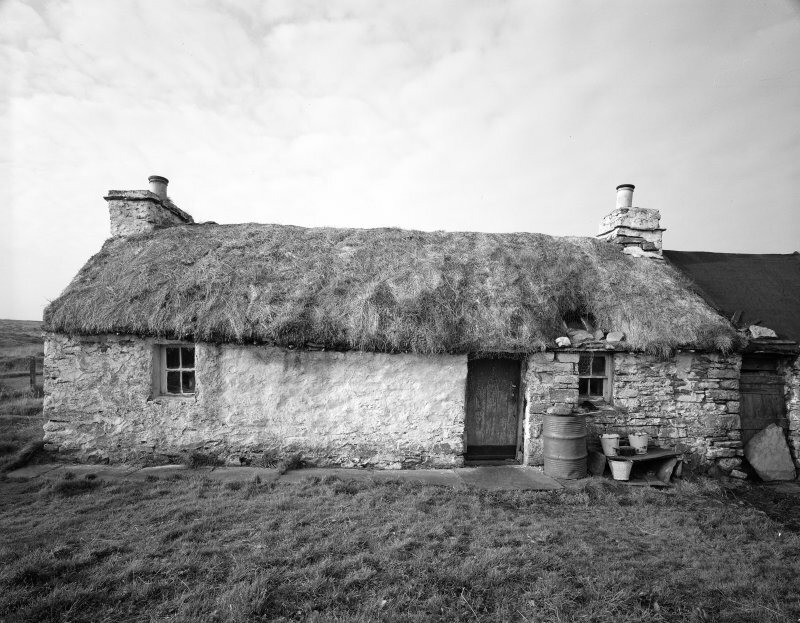 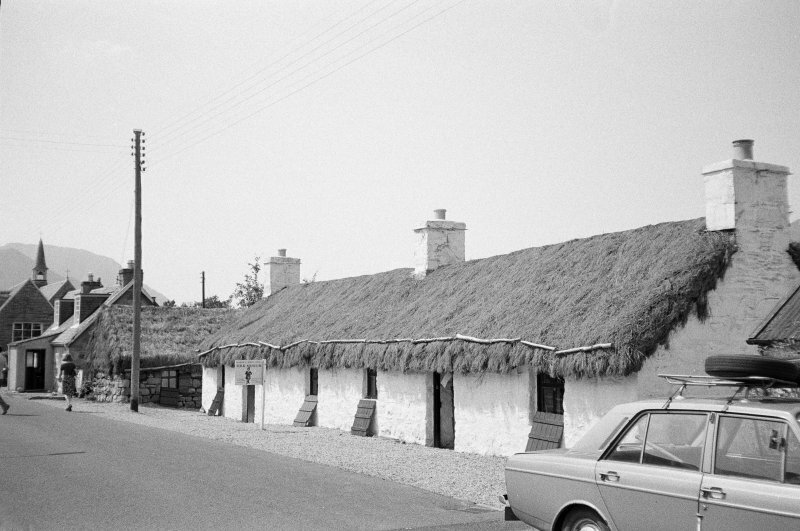 Described variously as creel houses, black houses or coupled cottages, and taking different regional forms, the often-misrepresented vernacular buildings of the Scottish countryside shared one common element – the cruck. 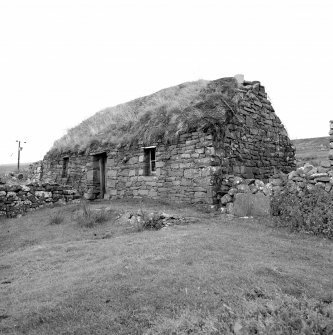 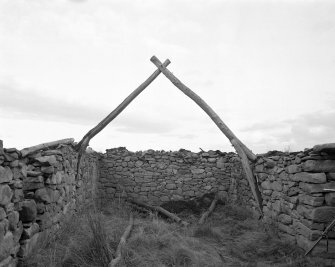 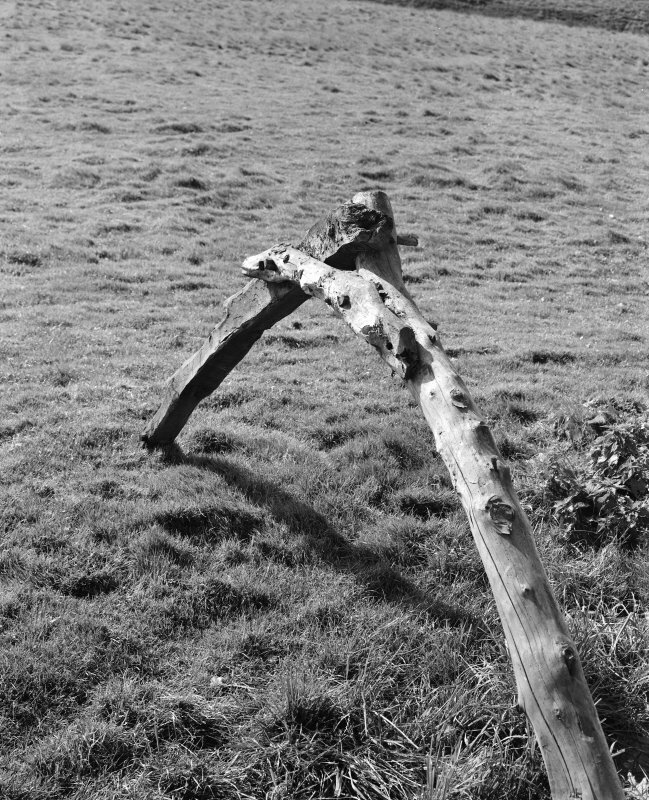 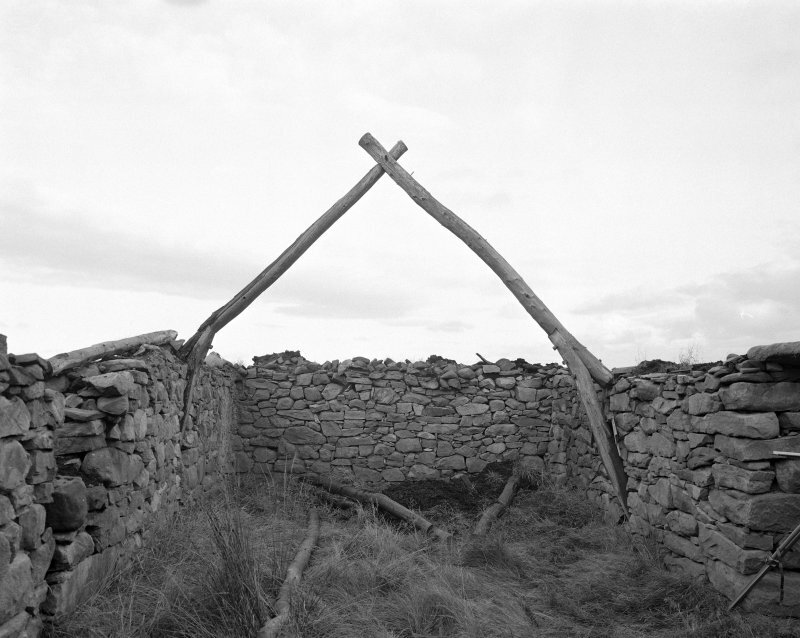 Crucks, or couples as they were often called in Scotland, comprised pairs of curved timbers joined at the top to carry the enormous weight of the roof (built of timber, turf and thatch) directly to the ground, taking the strain off the side walls, which were often lightly-built affairs of turf or clay. 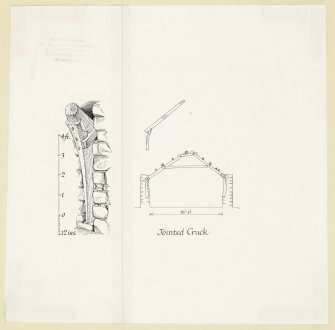 Sometimes the builders were able to use single timbers, selected from the curved bough of a tree, though it was more common for several shorter lengths to be used, pinned together with wooden dowels. Sometimes other artefacts were recycled, such as the boat timbers seen at Ramscraigs in Caithness. 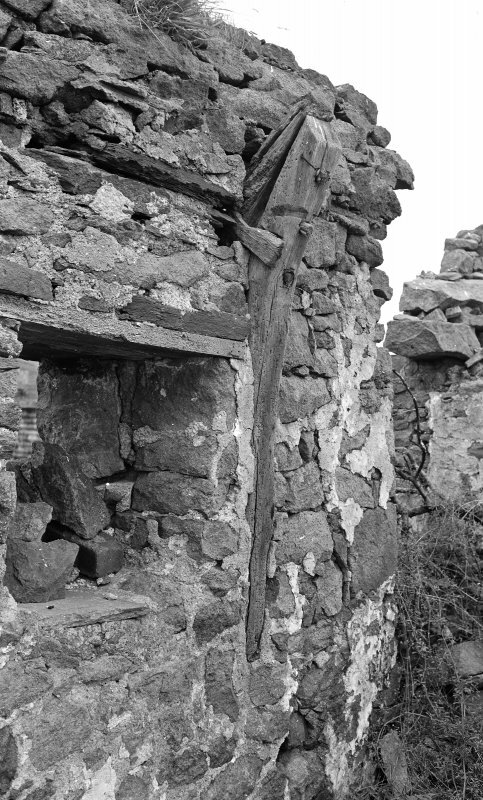 From the late 1700s stone cottages became more common, with walls robust enough to support the roof, and cruck constructions became increasingly rare, though in parts of the country the tradition of incorporating crucks into stone walls persisted well into the 19th century. 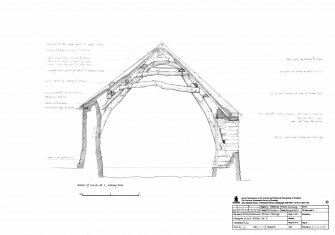 As organic, biodegradable structures, cruck-framed buildings are prone to rapid deterioration once they fall out of use. Unfortunately for us this means a very important part of our heritage is rapidly disappearing. 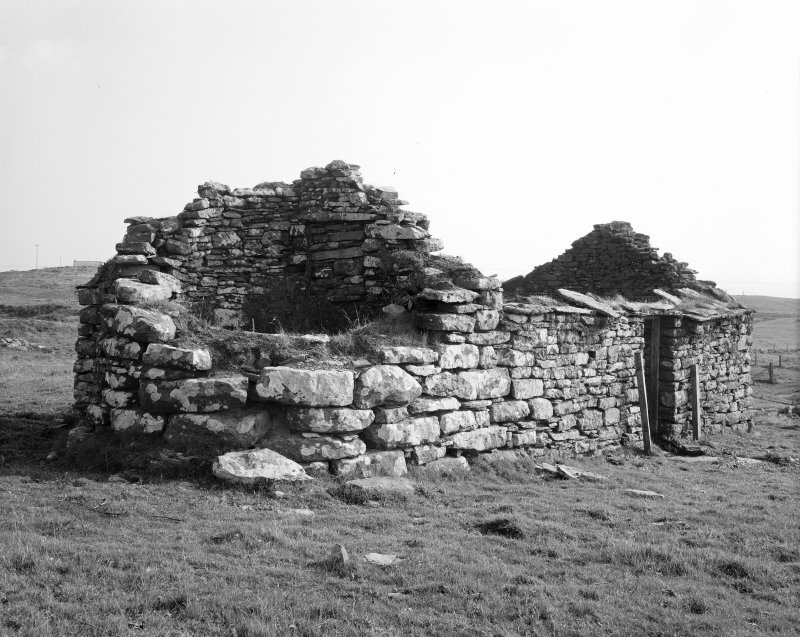 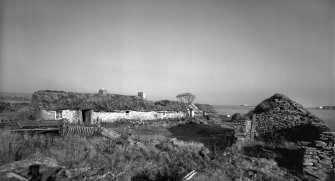 Over the past 50 years RCAHMS has recorded dozens of examples; some of these were subsequently demolished to make way for new development, but others have been restored, renovated and given new life. 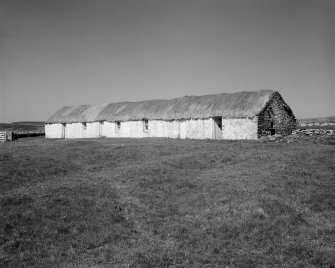 This gallery draws together the best of these records for the first time, allowing us to appreciate both the functional craftsmanship of the builders and the skills of the photographers and surveyors who bring them alive for us today. Some cruck-framed buildings have been restored for further use as museums. If you want to visit an authentic example of a restored cruck-framed cottage the Glencoe Folk Museum is excellent. 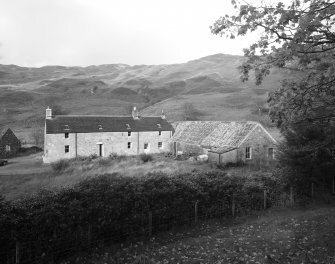 Others include Auchindrain Township Museum in Argyll, while the Highland Folk Museum in Newtonmore boasts several reconstructed examples. 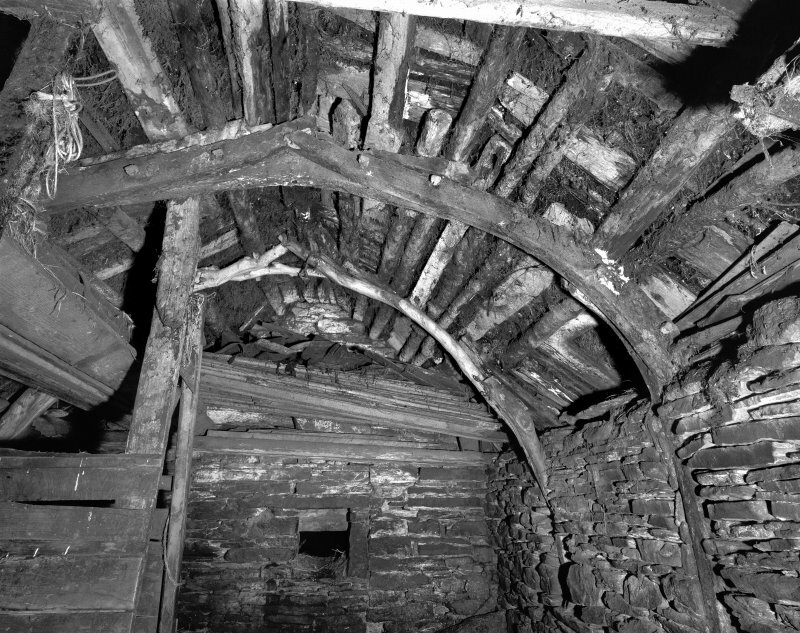 Interior of cruck-framed byre showing roof detail, roof groundwork and cruck-frame in foreground composed of re-used ships timbers; The Buaile, Ramscraigs. 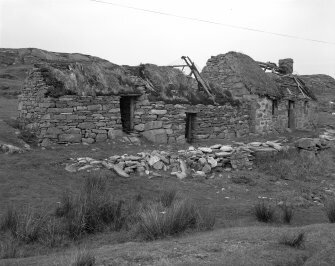 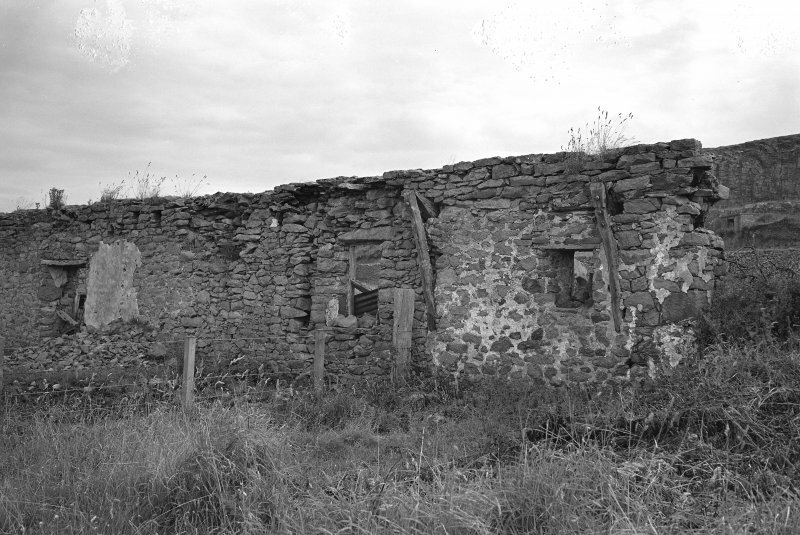 General view of The Buaile croft, taken from the left, Ramscraig. 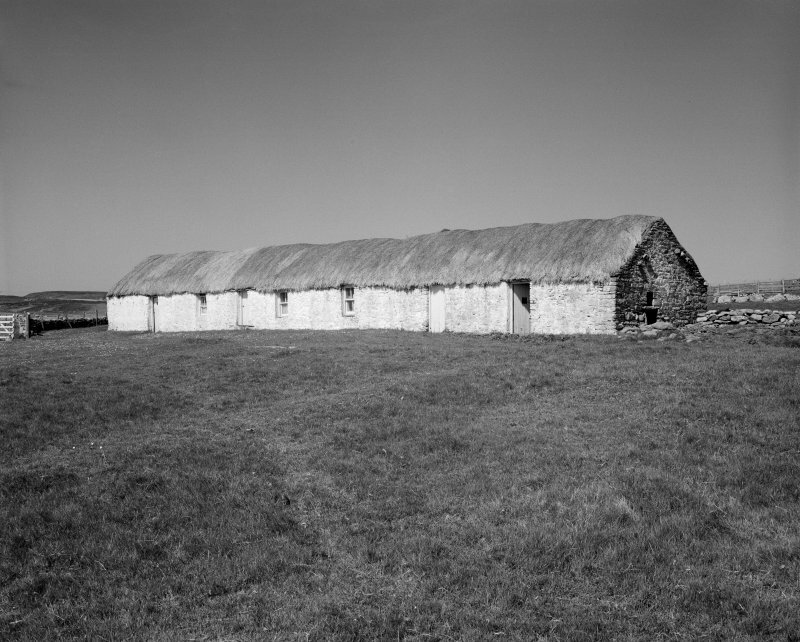 View of Longhouse taken from South West; Laidhay, Caithness. 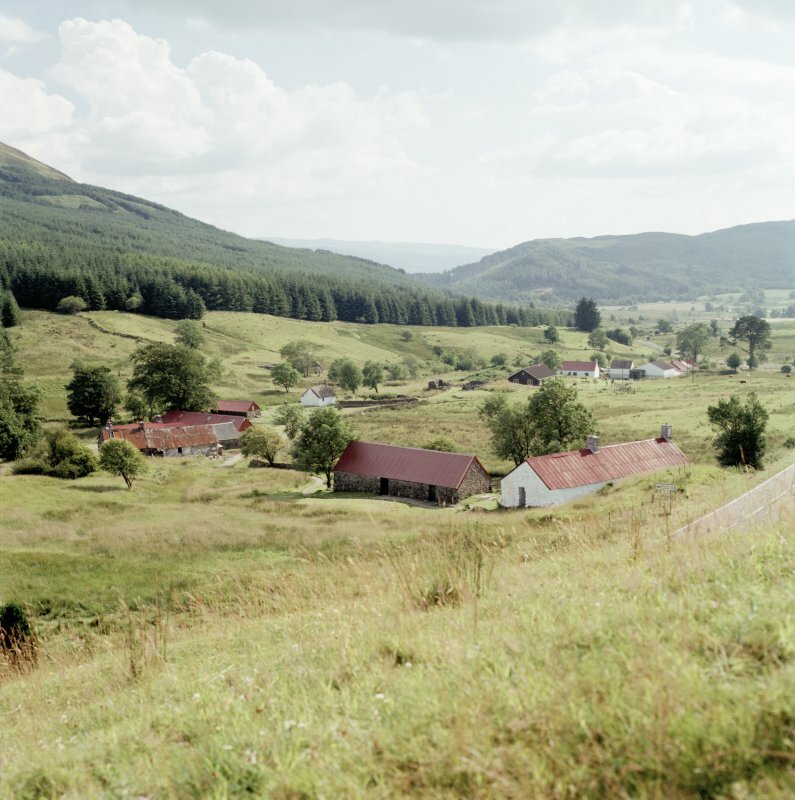 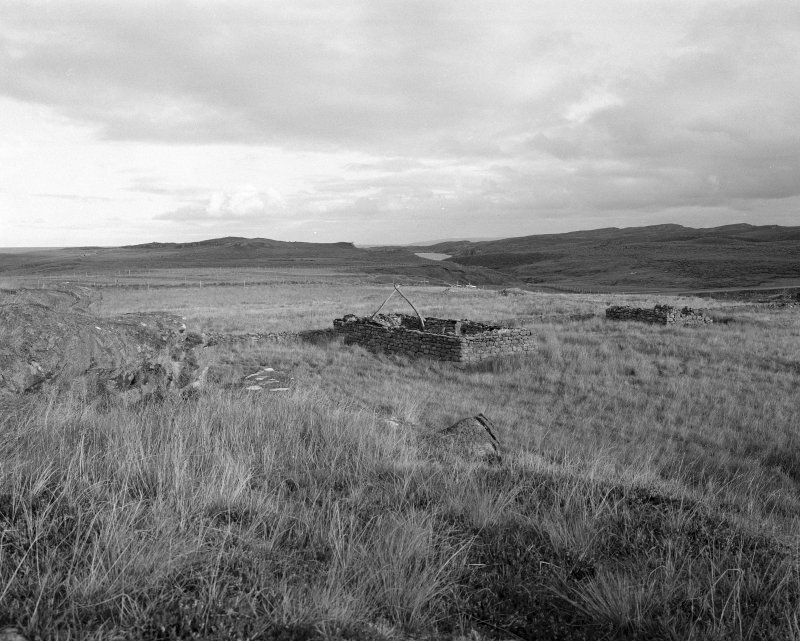 General view of eastern part of township from North East, Auchindrain. 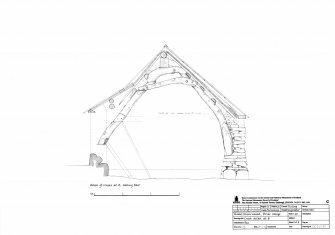 South West view of cruck-framed building; Lonbain. 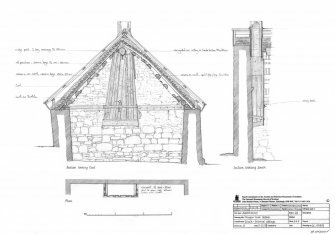 Survey drawing of cruck framed Cottage including section and isometric drawing; Lonbain, Applecross. 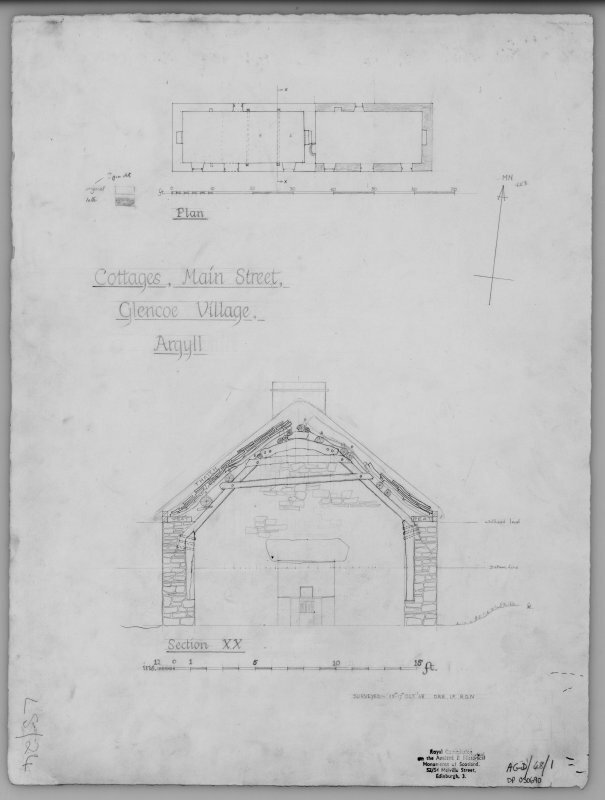 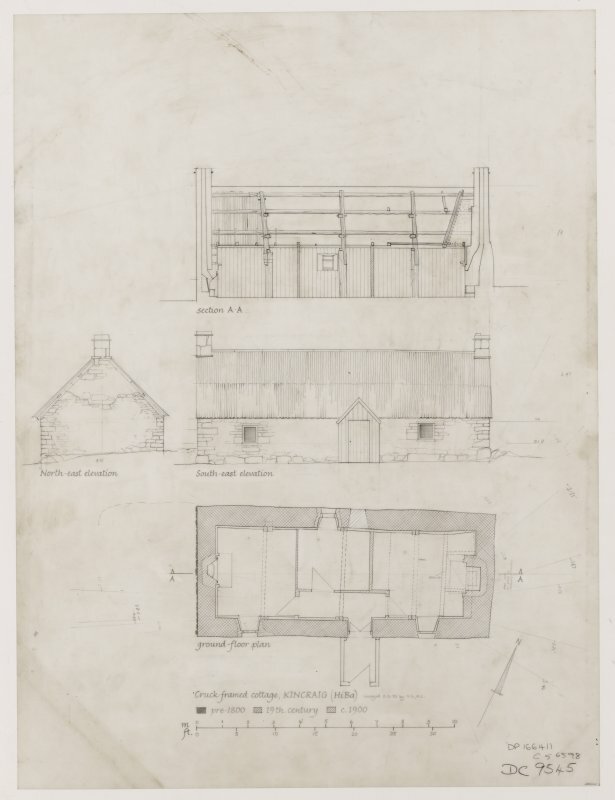 Plan of cruck-framed cottage; Glencoe. 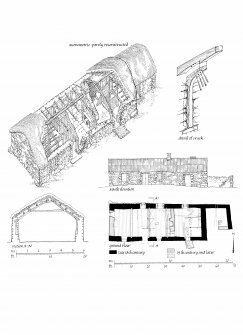 Section of cruck-framed cottage, Glencoe. 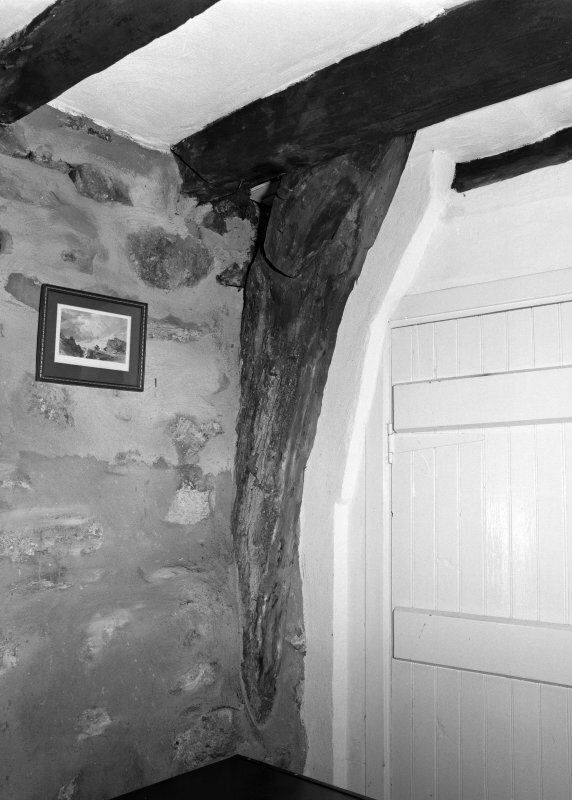 Cruck-framed cottage 'Hangin' lum' detail; Auchtavan. Section detail of half-cruck looking West, Lochearnhead. 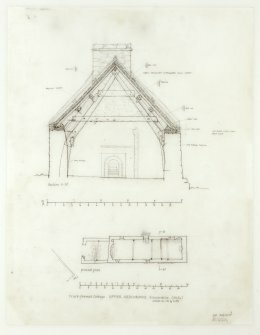 Section detail of cruck looking East; Lochearnhead. 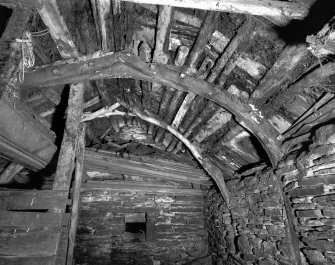 Interior view of cruck-framed byre; Keils, Jura. Detail of cruck joint and hanging chimney, Badden Cottage. 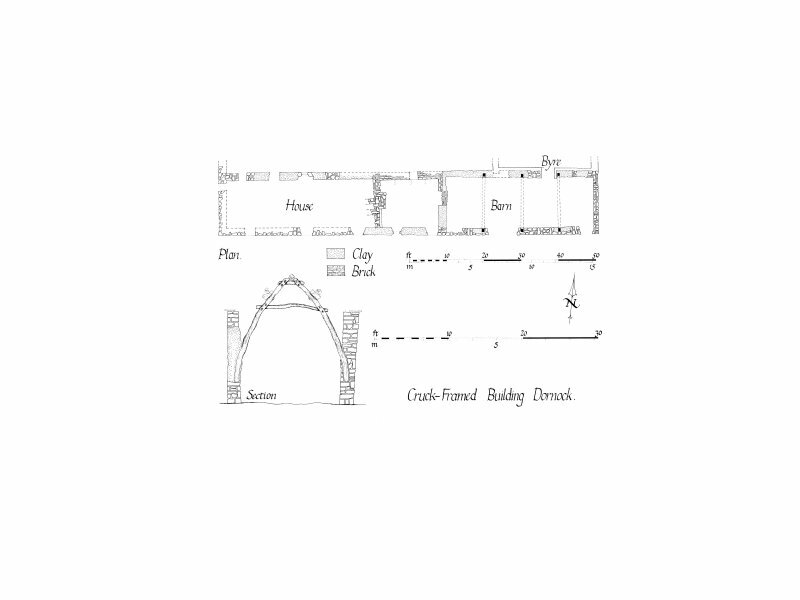 Ground floor plan and isometric drawing of partly recontructed cruck framed cottage. Baderskie. 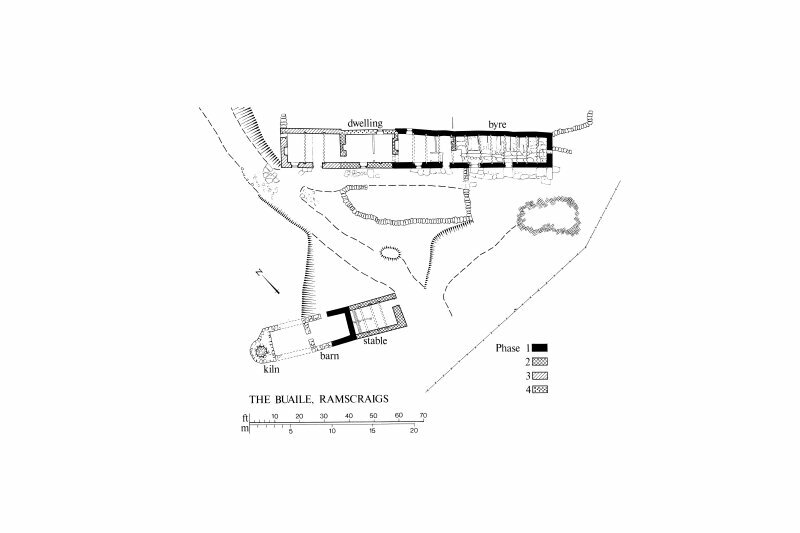 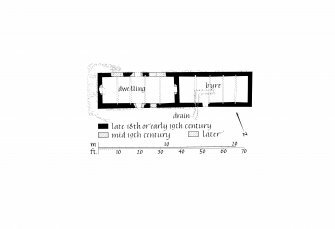 Plan of site, cruck framed byre and dwelling at the Buaile, Ramscraigs. Publication drawing. 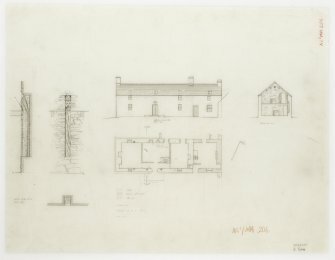 Kilbride farmhouse; south elevation, ground floor plan, section and cruck detail. 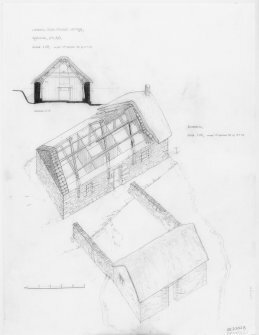 Drawing of building D composed of axonometric partial reconstruction, detail of cruck, South elevation, ground floor plan and section. 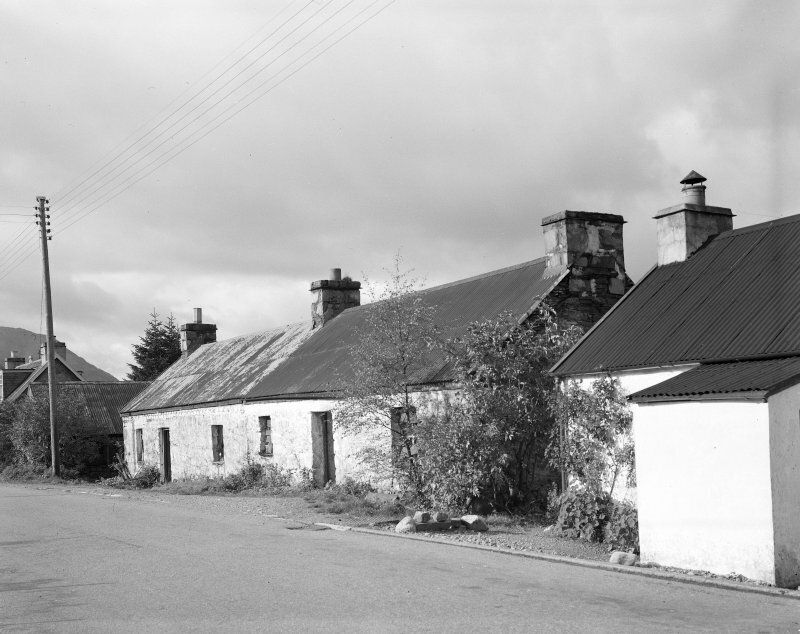 Auchindrain. 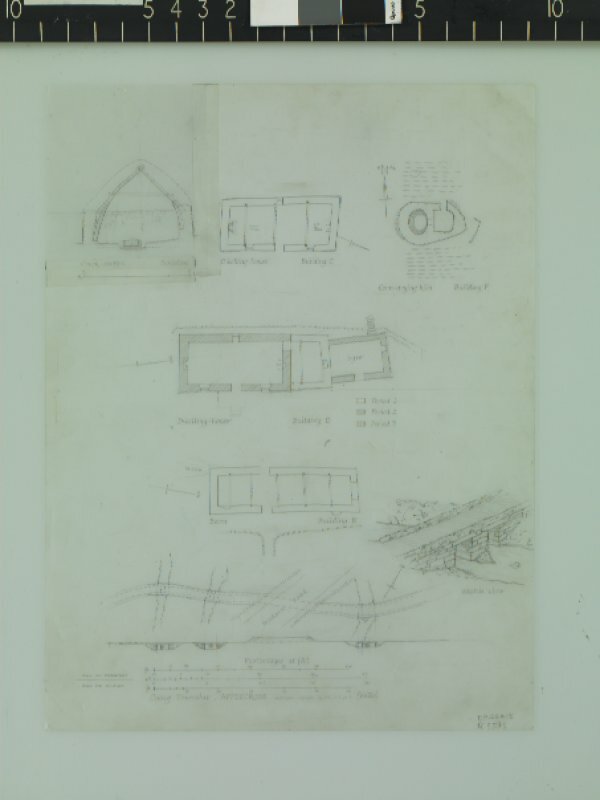 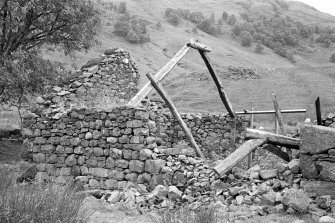 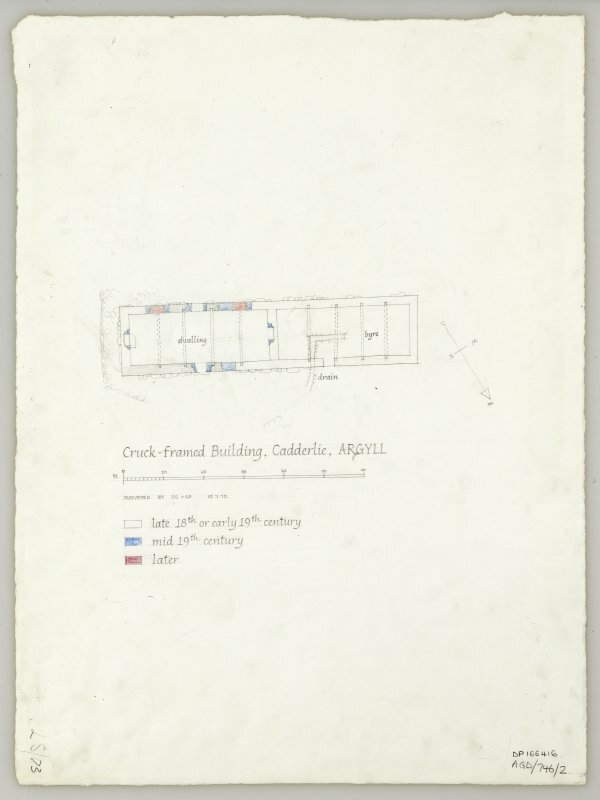 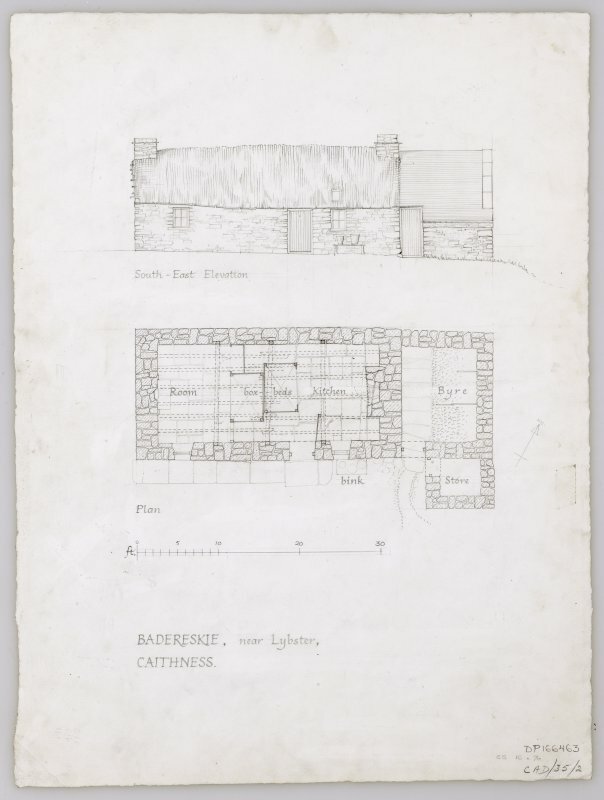 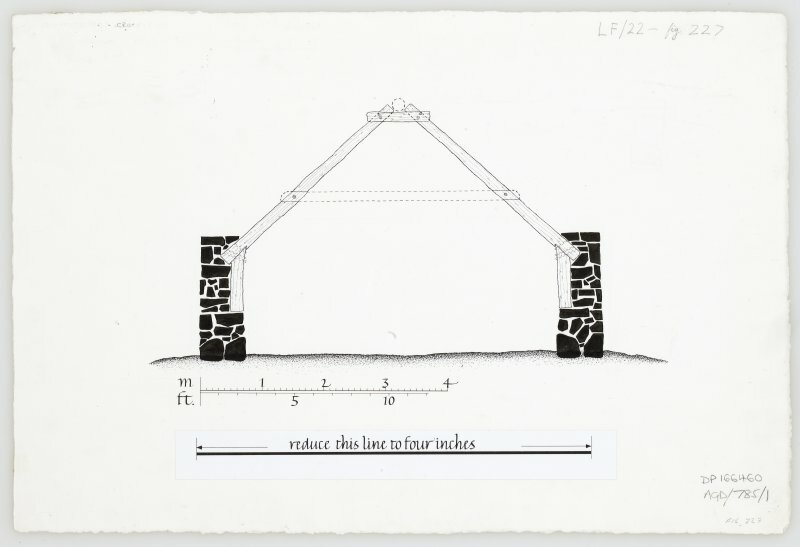 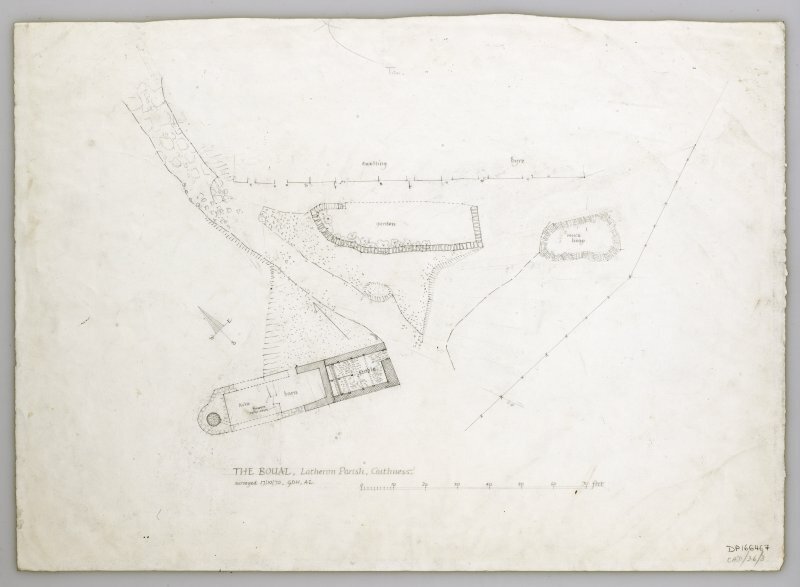 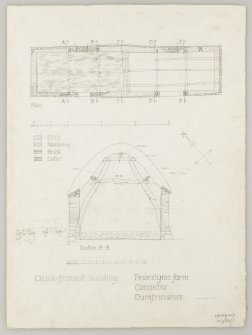 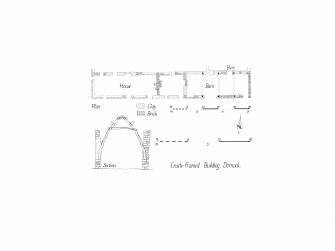 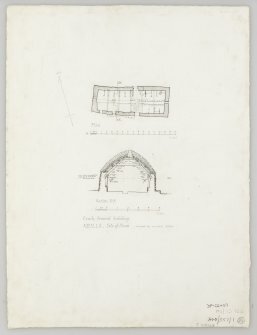 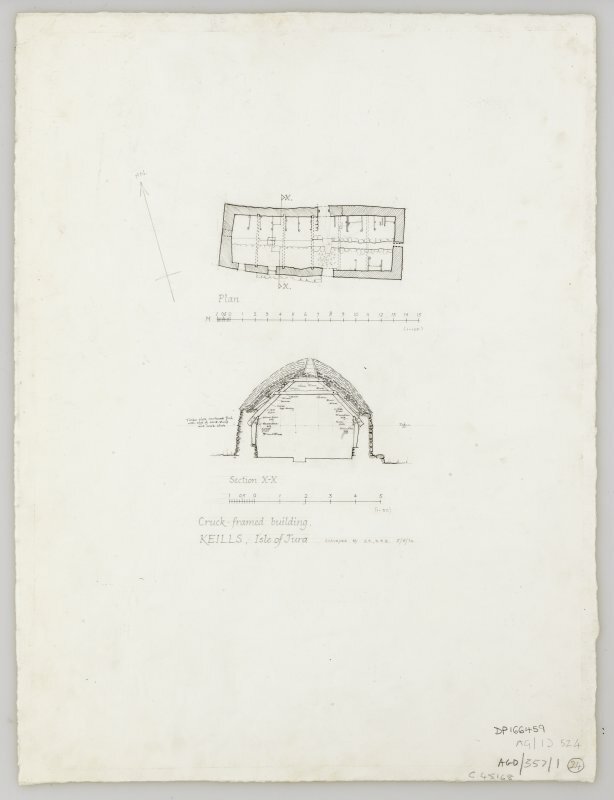 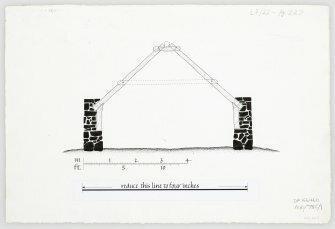 Plan of cruck framed building; Cadderlie, Loch Etive. 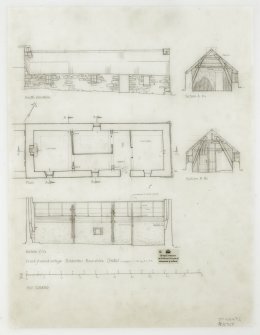 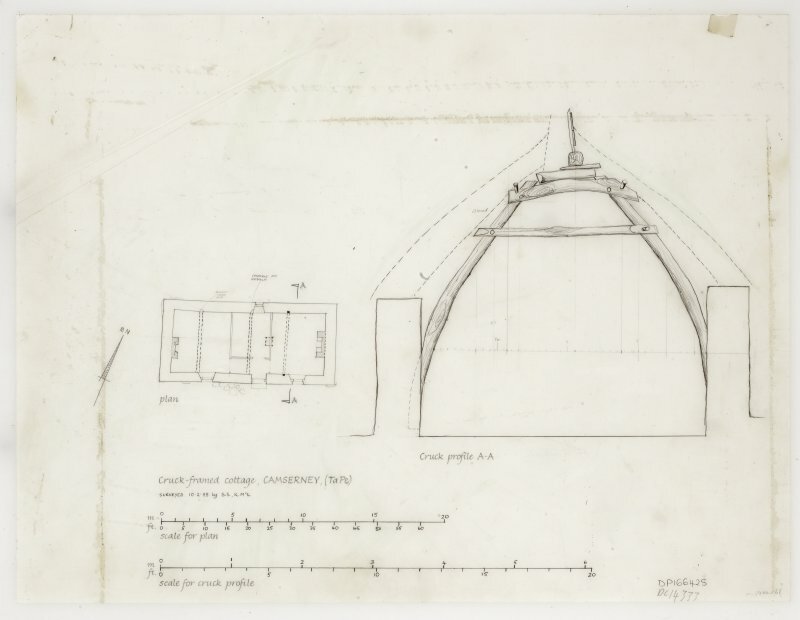 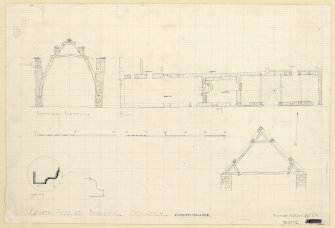 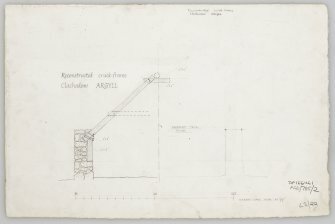 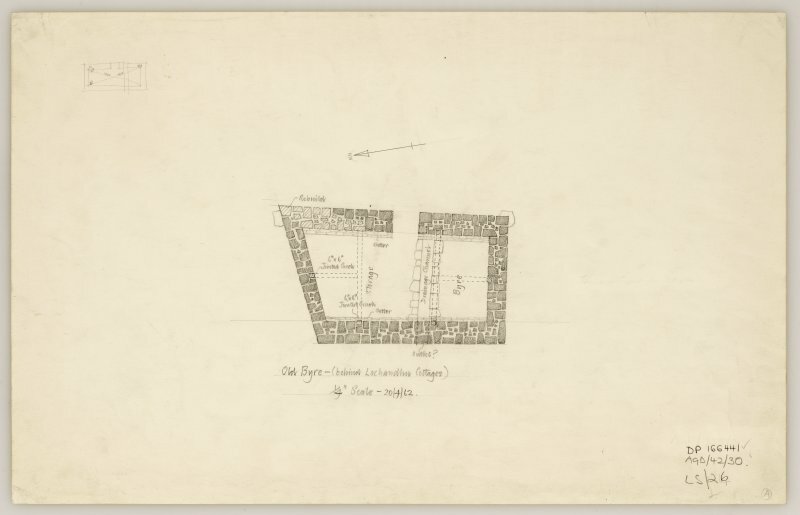 Publication drawing; plan and section of cruck framed building; Jura, Keils. 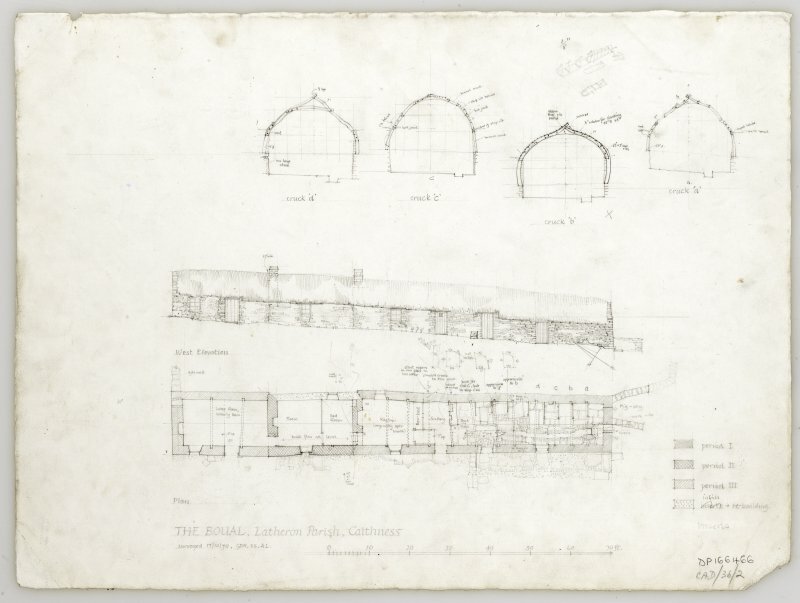 Survey plan and section showing cruck frame cottage, Dornock. 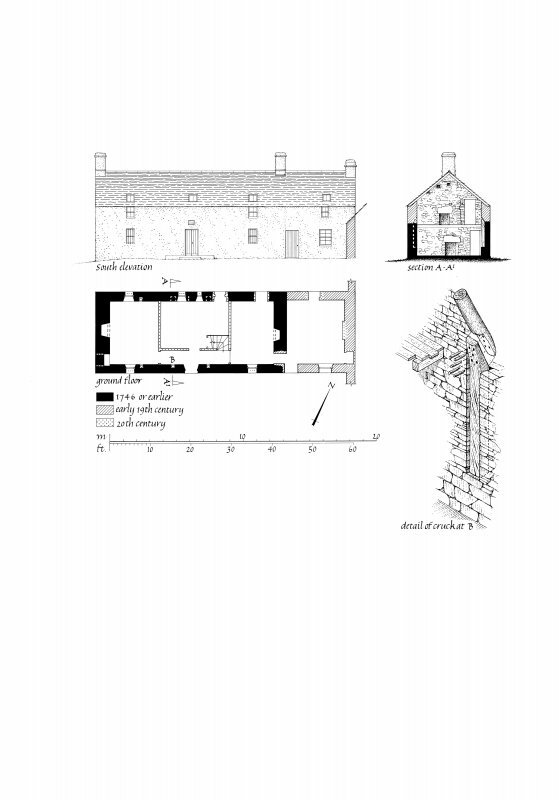 Survey drawing of cruck framed cottage featuring ground floor plan and section X-X1; Upper Archronie, Kincardine. 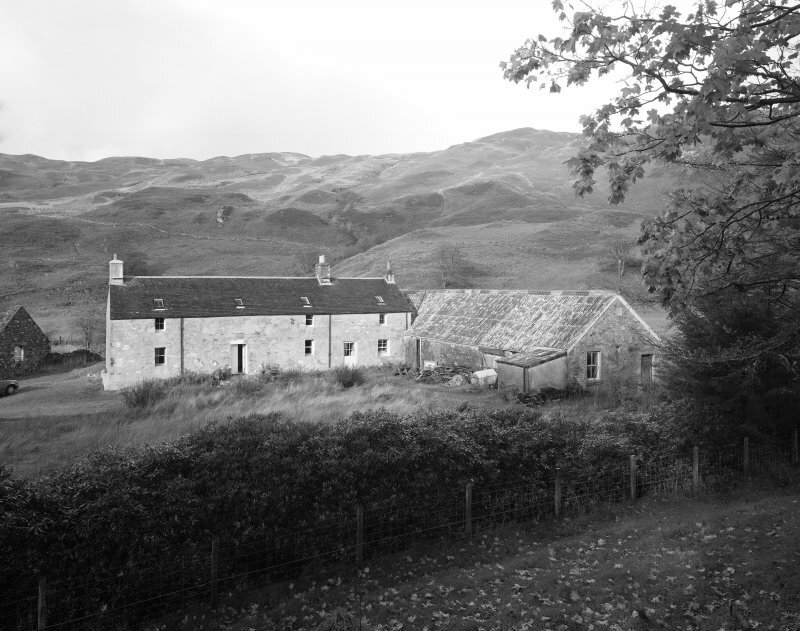 Kilbride Farm. 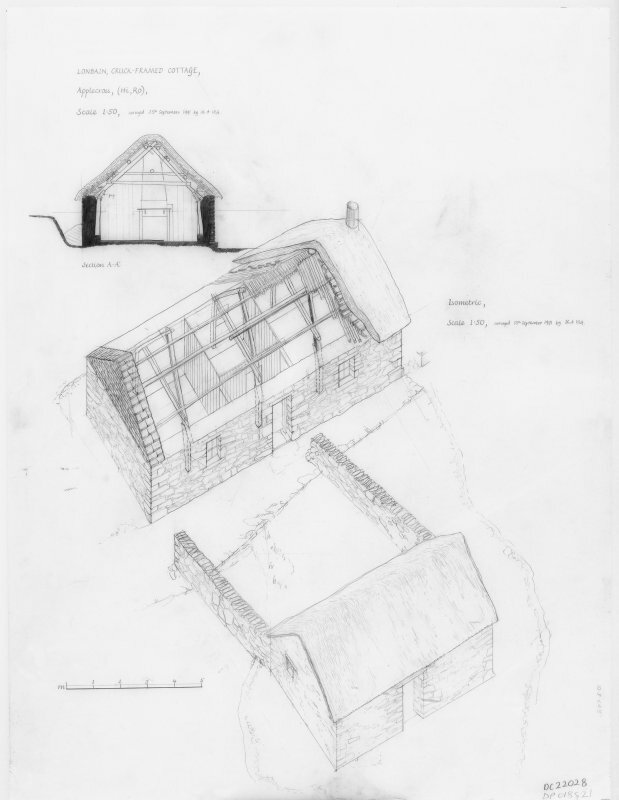 Survey drawing of cruck framed building featuring south elevation, ground floor plan, section and cruck detail; Kilbride Farm. 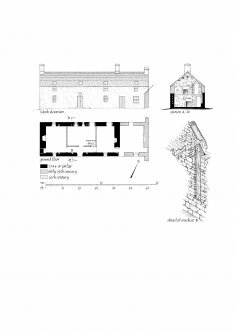 Survey drawing of cruck framed cottage featuring ground floor plan, south east elevation, north east elevation and section; Kincraig. 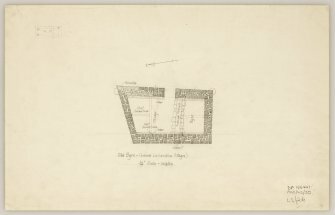 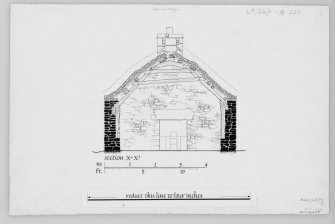 Survey drawing of cruck framed building and corn drying kiln, showing cross section, plans and sketch view; Cuaig Township, Applecross. Field survey drawing featuring a site plan and cruck section; Fearnbeg, Applecross. Information transferred to drawing RCD 67/2 to show complete site plan. 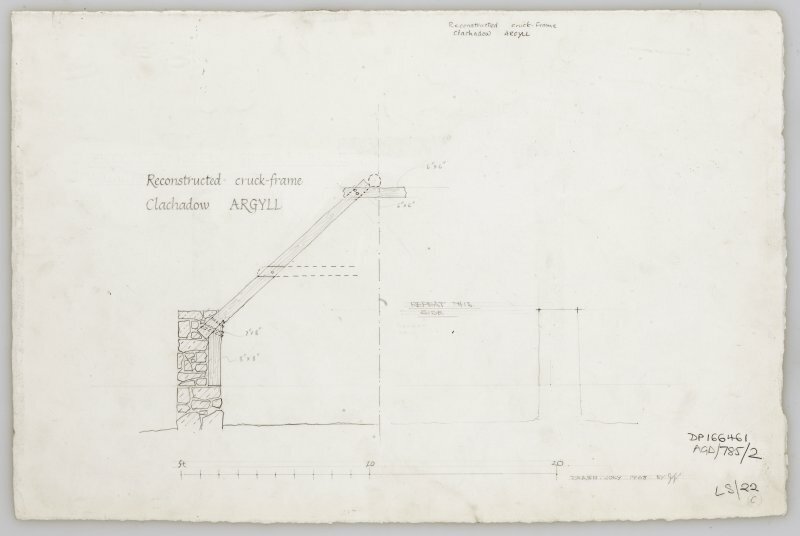 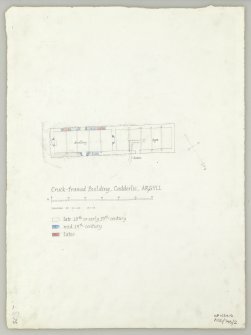 Plan of jointed cruck and reconstruction of jointed cruck; Kilkivan. 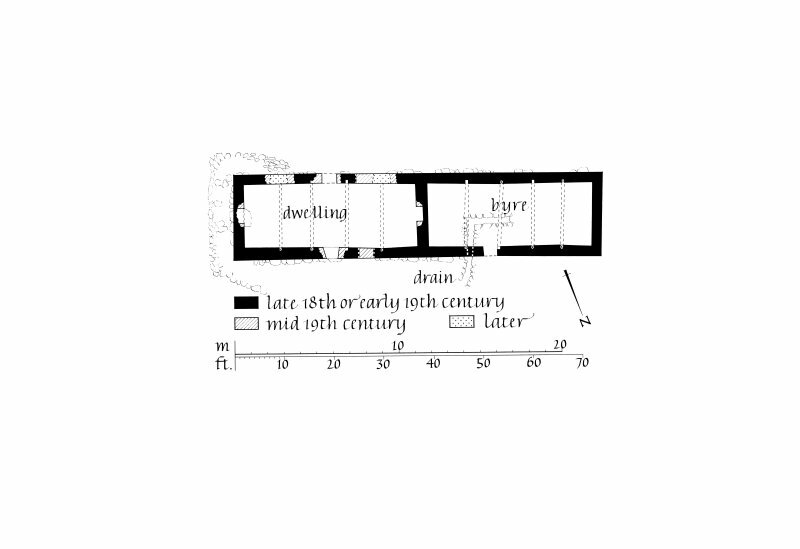 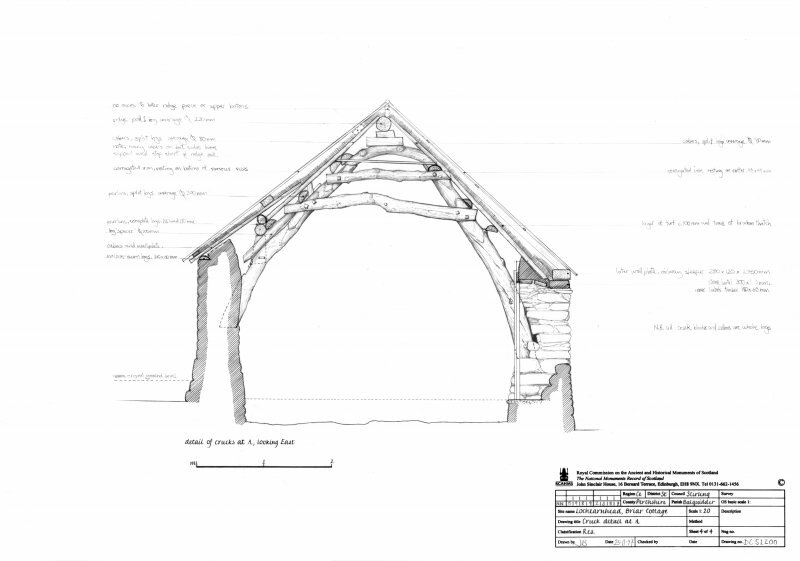 Survey drawing of cruck framed cottage featuring a plan and cruck profile; Camserney. 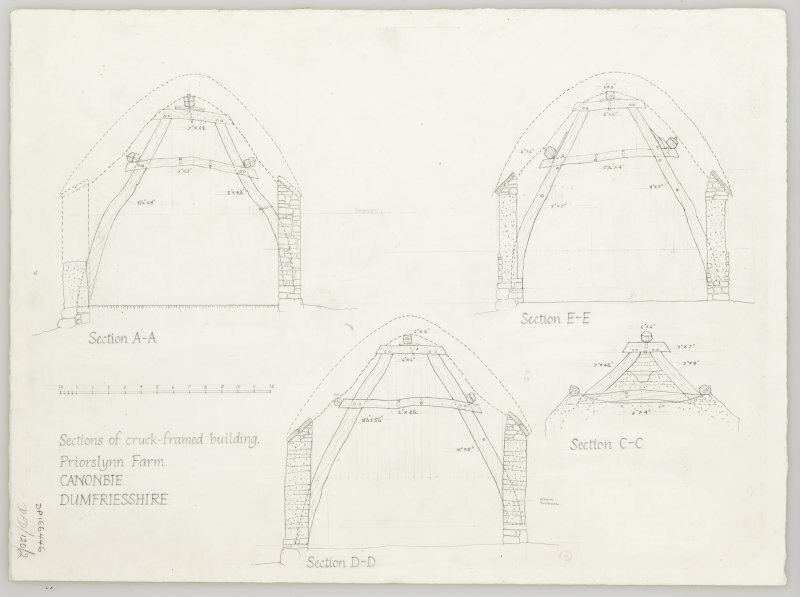 Plan and section of cruck-framed building at Priorslynn, Dumfriesshire. 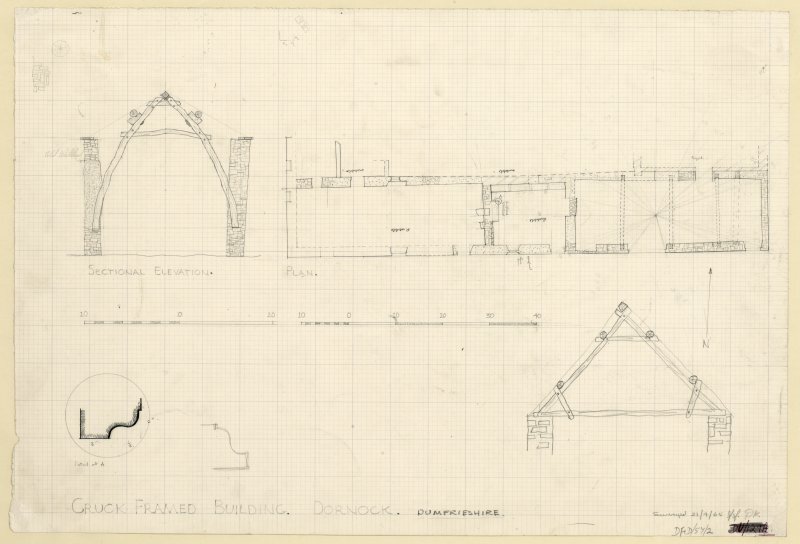 Draft survey plan, section showing cruck frame, section showing pitched roof structure and details of moulding profiles; Dornock, Dumfrieshire. 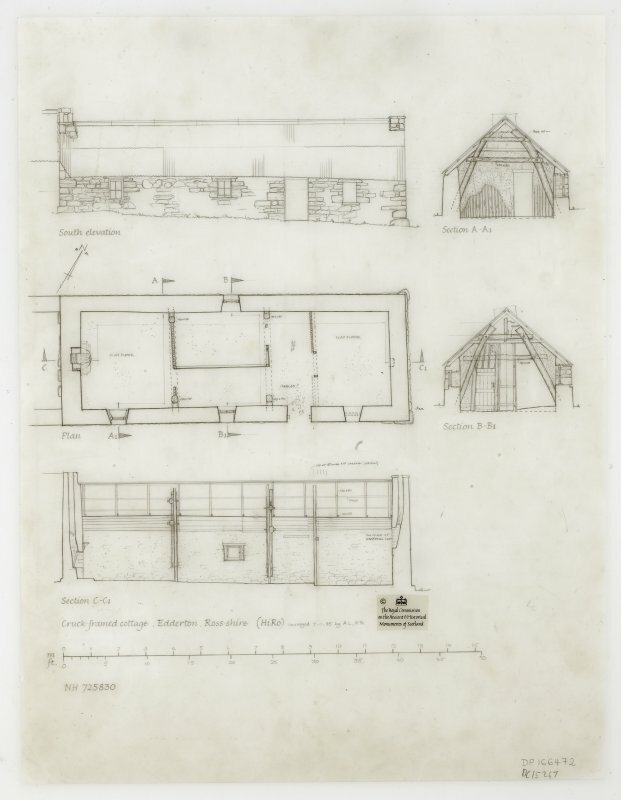 Plan of cruck framed byre behind Lochandhu cottages; Bonawe. 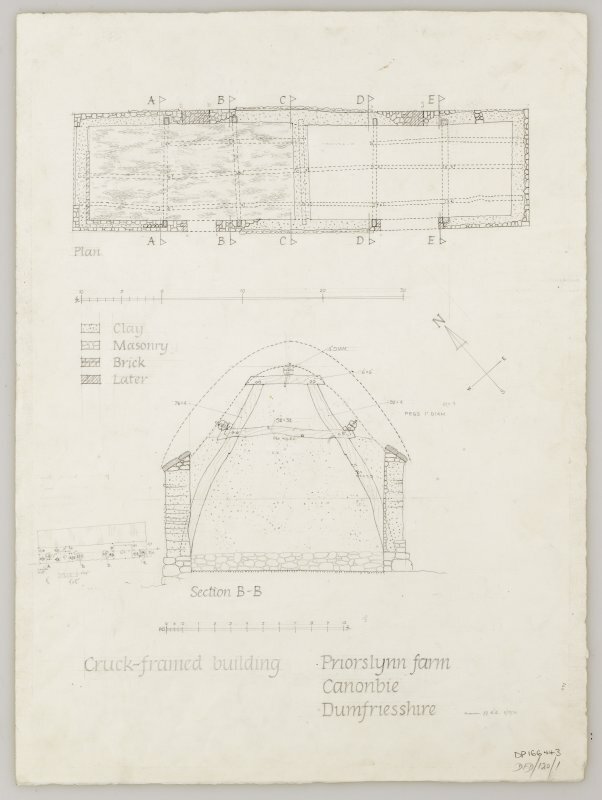 Plan and section of cruck-framed building; Priorslynn farm, Canonbie, Dumfriesshire. 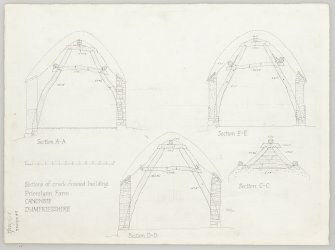 Sections of cruck-framed buildings at Prioslynn Farm, Canonbie, Dumfrieshire. 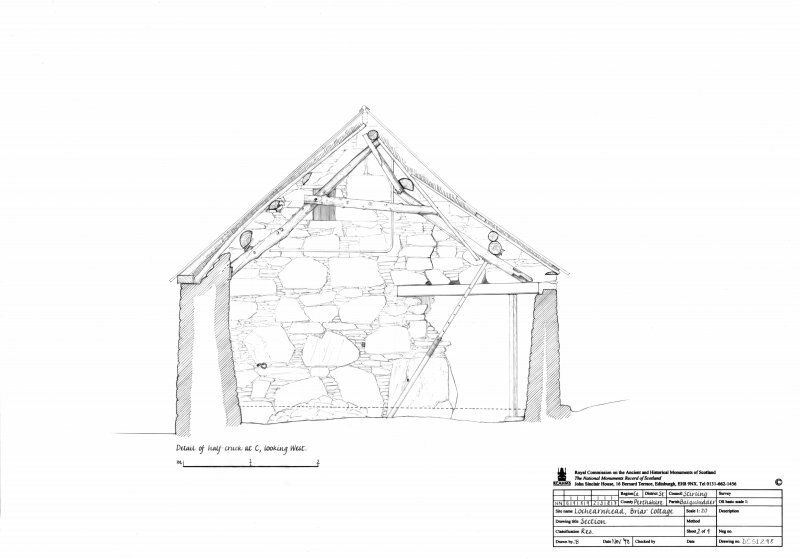 Survey drawing of cruck-framed building featuring plan and cross section; Keills, Jura. 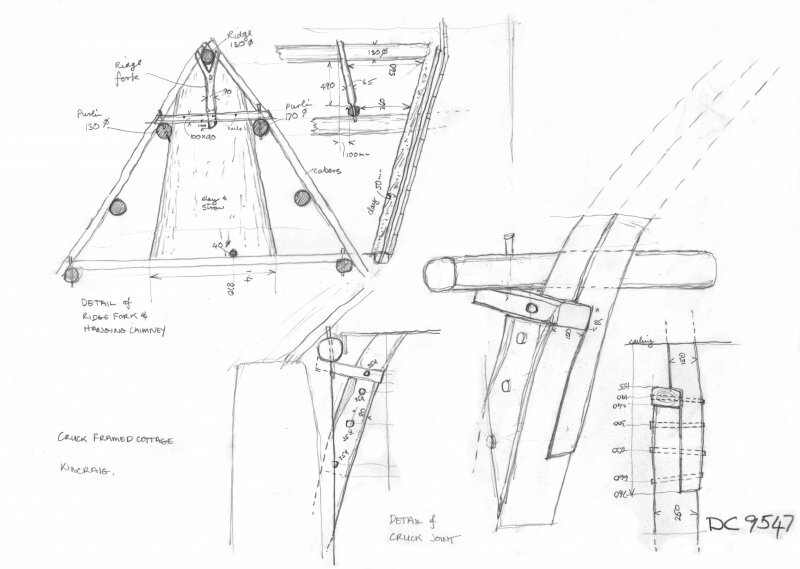 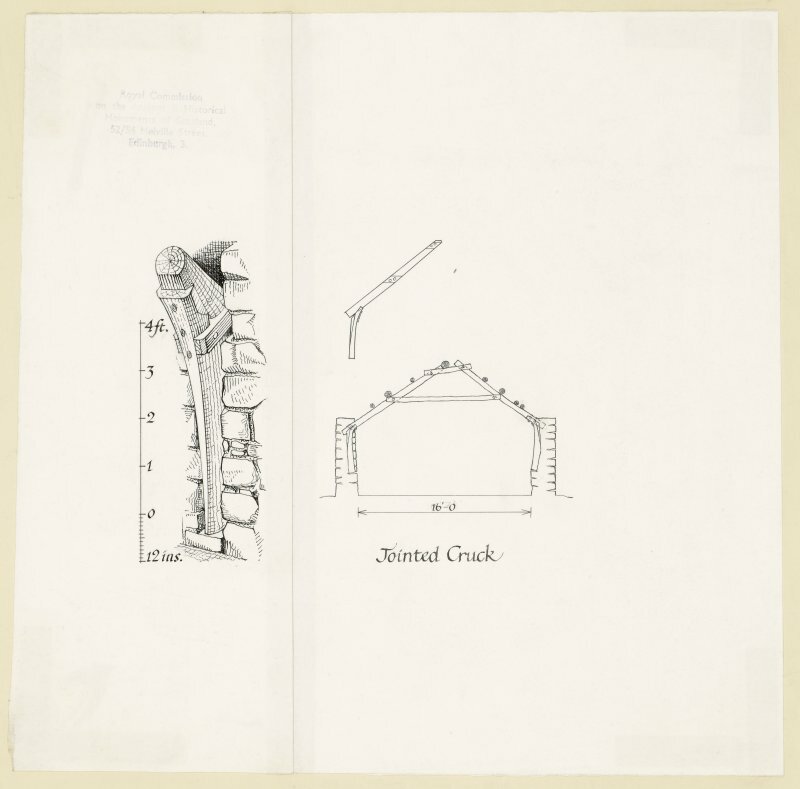 Publication drawing of cruck-frame reconstruction section;Clachadow. Section reconstruction of cruck-framed house; Clachadow. 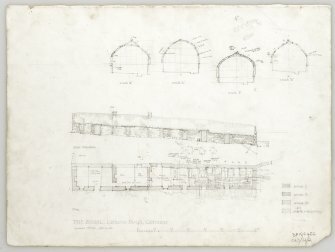 Survey drawing featuring; site plan, south-east elevation, isometric drawing and plan of cruck-framed building; Baderskie, Catihness. Survey drawing of cruck-framed building featuring elevation and plan; Baderskie, Caithness. 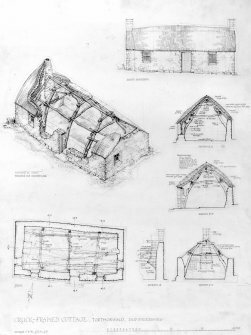 Survey drawing of cruck-framed building featuring; plan, west elevation and cruck sections; the Boual, Caithness. 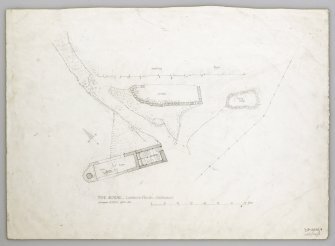 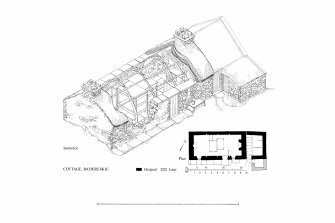 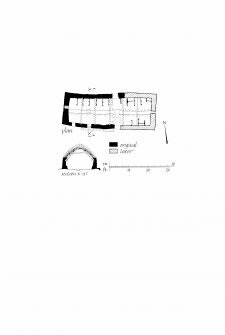 Site plan including cruck-framed kiln barn at the Boul, Caithness. 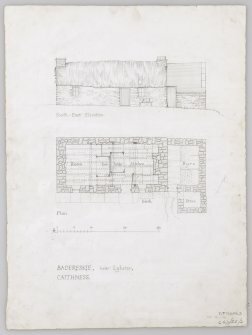 Survey drawing of cruck-framed cottage featuring plan, south elevation and sections; Edderton, Ross-shire. 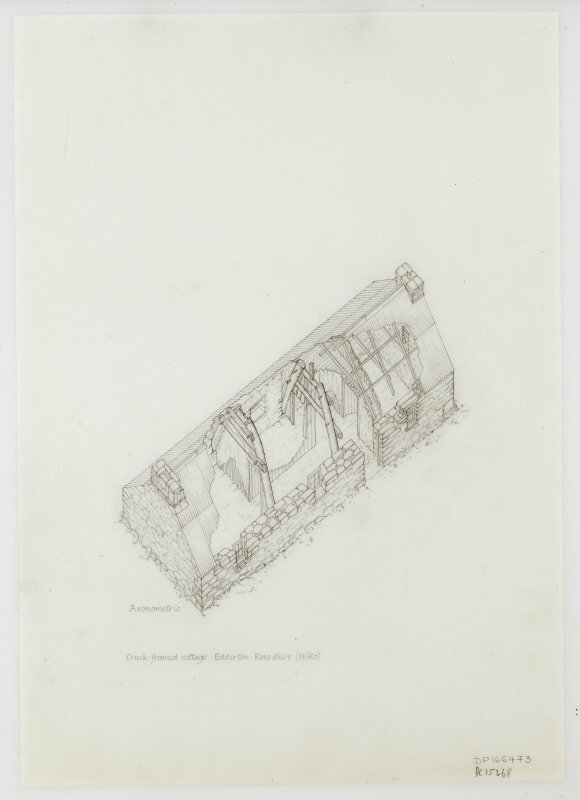 Axonometric view survey drawing of cruck-framed cottage; Edderton, Ross-shire. 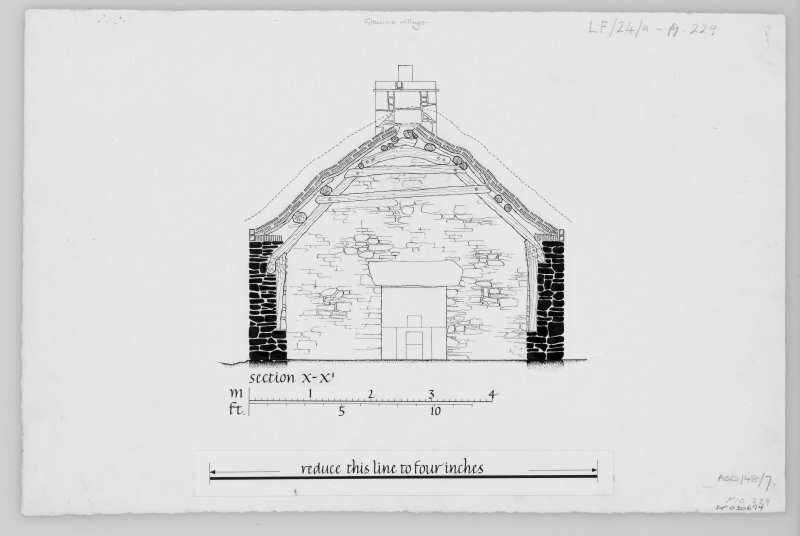 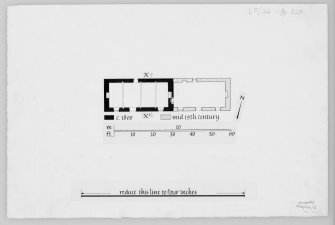 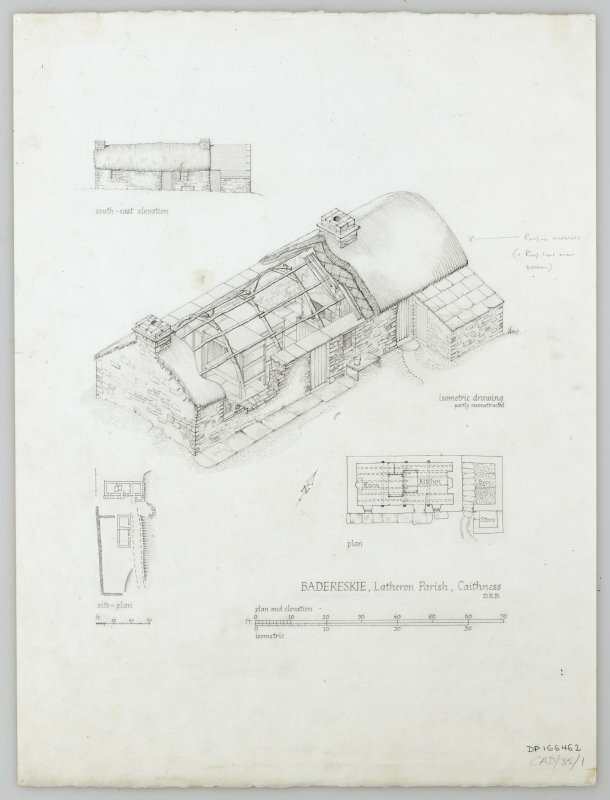 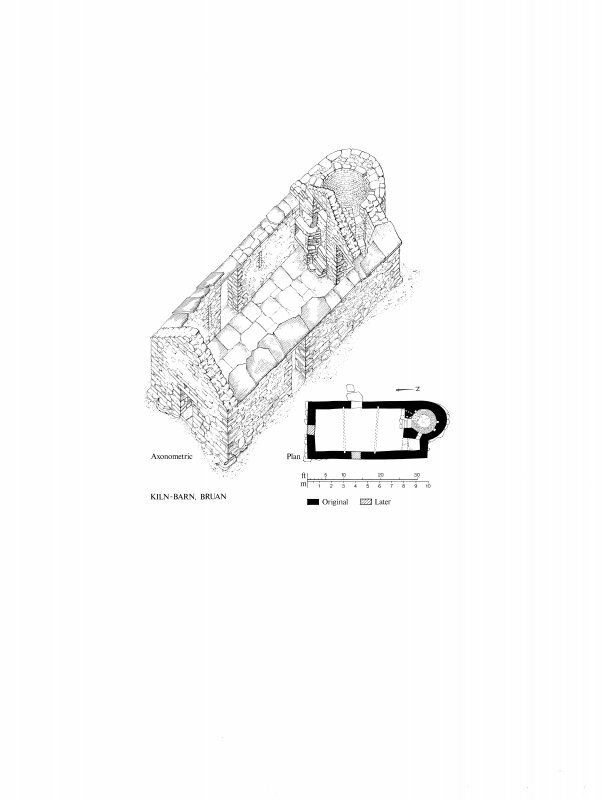 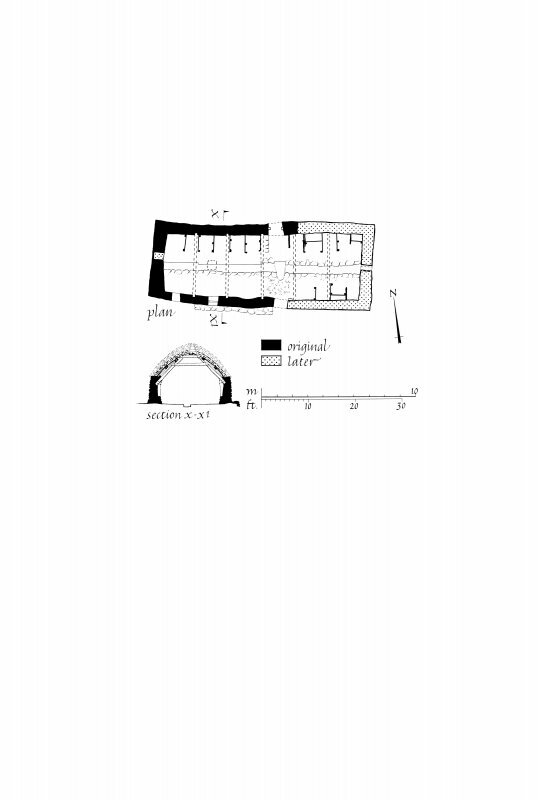 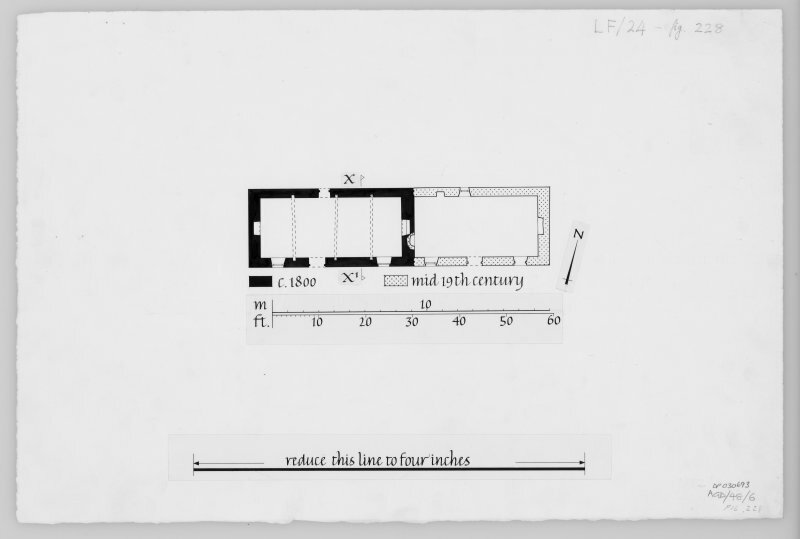 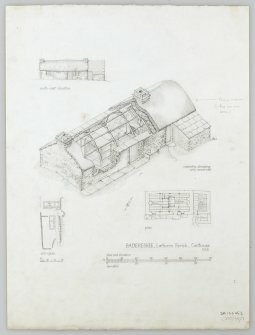 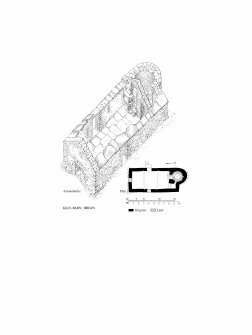 Survey drawing showing ground floor plan and axonometric view of kiln-barn, Bruan. General view from South, Kilbride Farmhouse. View from East of cruck-framed building; Crachan Farm, Camserney. 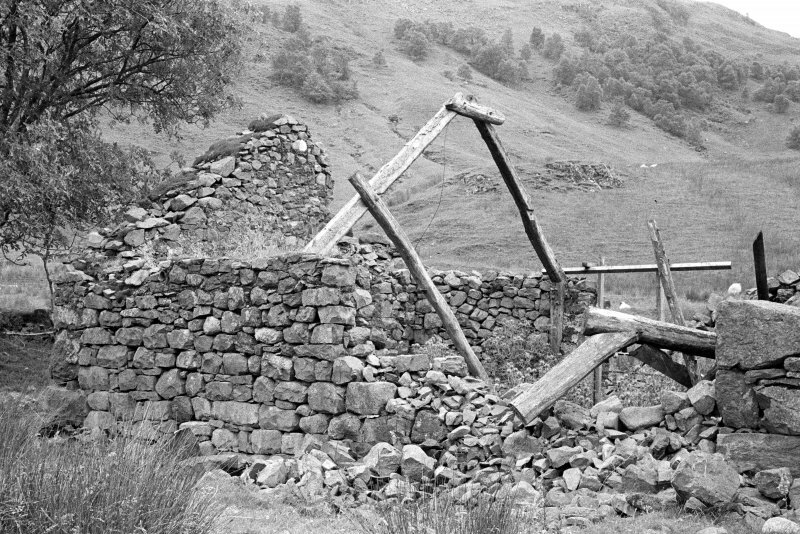 View of cruck-framed cottage from the south east; Glencoe. 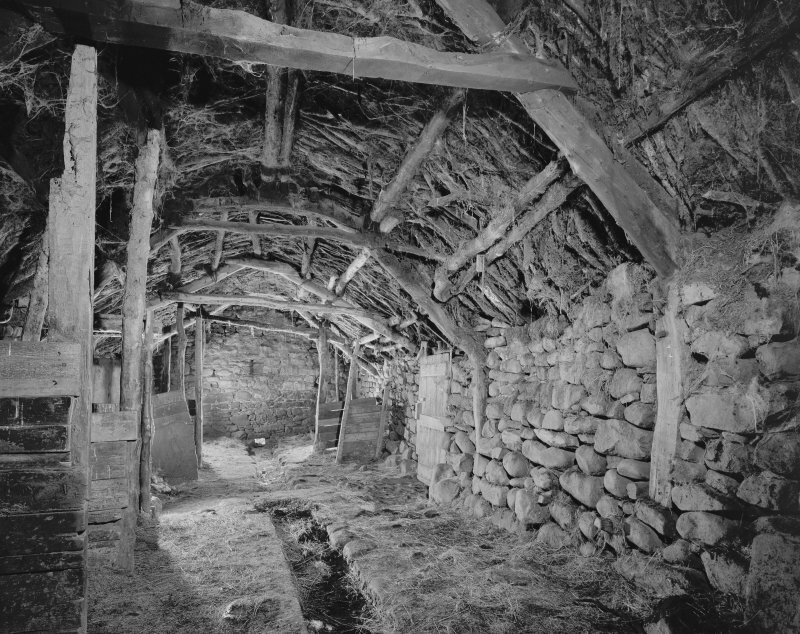 General view of cruck-framed cottage, now a folk museum; Glencoe. General view of cruck-framed cottage from south west; Glencoe. 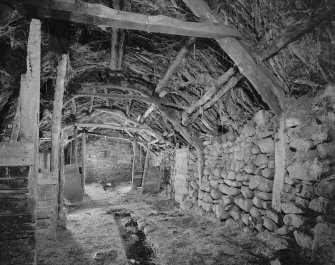 Interior of cruck-framed cottage from west; Glencoe. 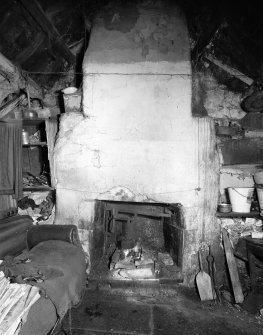 Detail of crucks in cruck-framed cottage in east end of south wall; Glencoe. 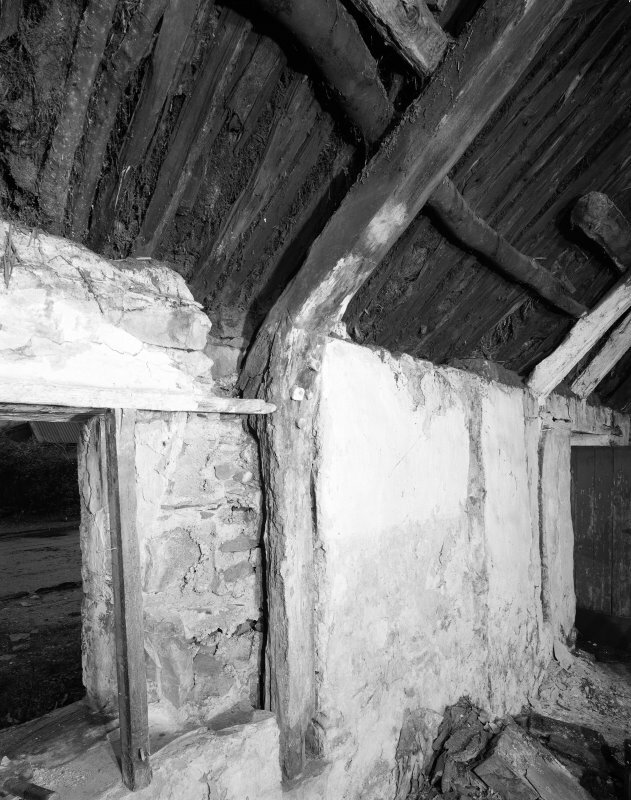 Cruck blades in cruck-framed house; High Kilkivan, Cambeltown. 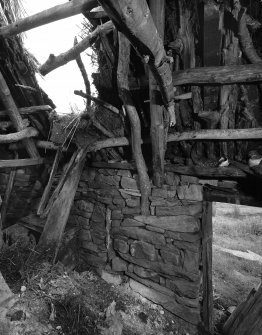 Detail of cruck-blade, High Kilkivan; Cambeltown. 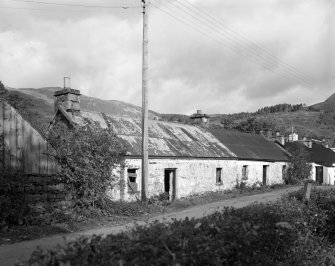 View of cruck-framed cottage; Clachadow, Glen Lonan. 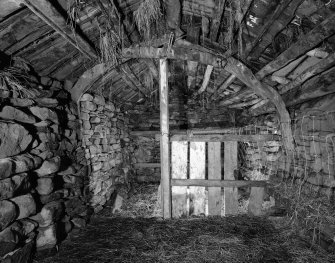 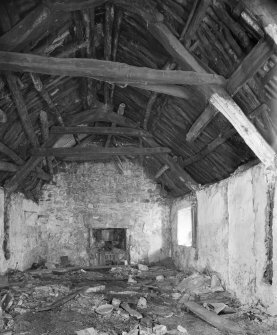 Interior of cruck-framed byre; Keils, Jura. 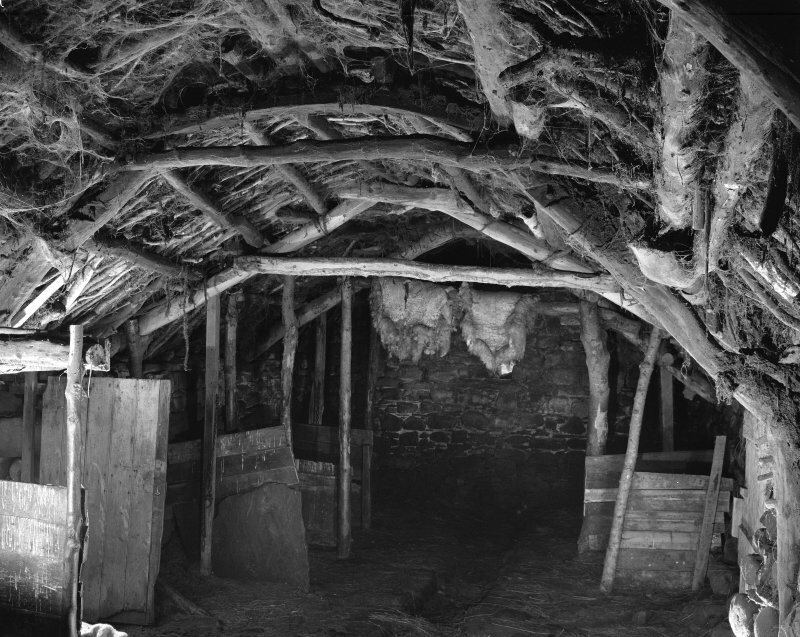 Surviving cruck truss within cruck-framed cottage; Latheron, Caithness. 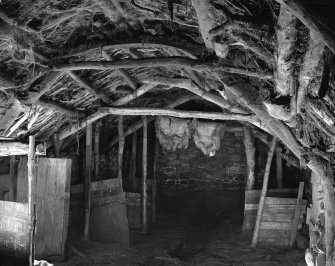 Interior of cart shed, cruck-frame and roof groundwork formed of salvaged ships' timber; Laidhay, Caithness. Remains of upper portion of cruck truss; Borgue, Caithness. 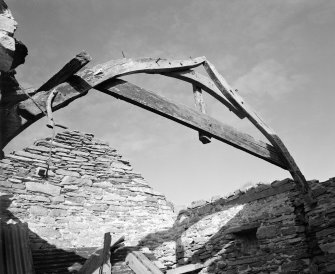 Detail of cruck-frame formed from re-used boat timbers; Ramscraig, Caithness. 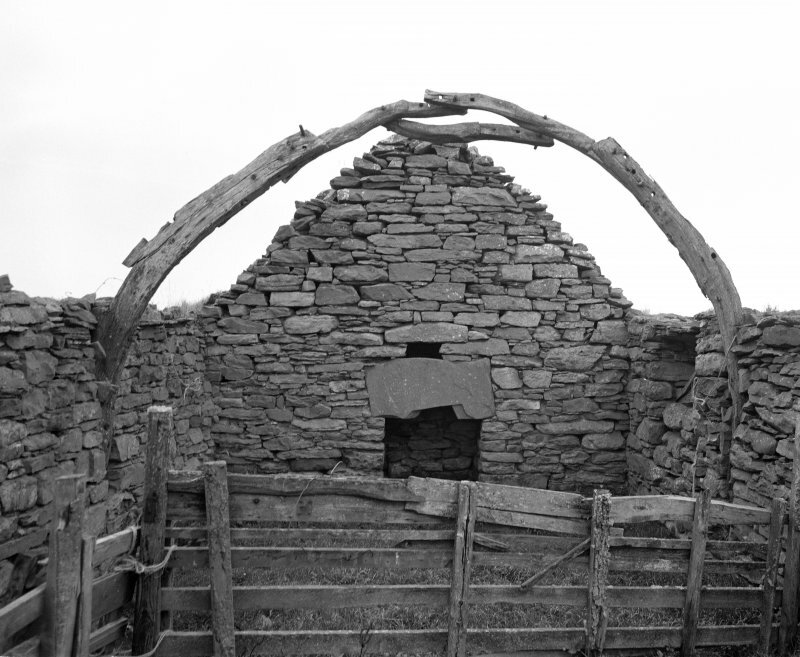 View from the north west of a Kiln barn; Bruan, Caithness. 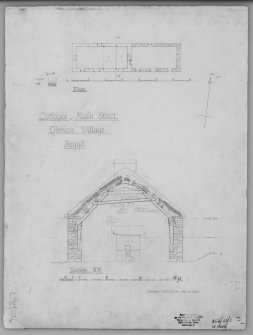 South east elevation of a cruck-framed cottage; Baderskie. Kitchen and fireplace in the north east wall of a cruck-framed cottage; Baderskie. General view from south of cruck-framed building; Fearnbeg. 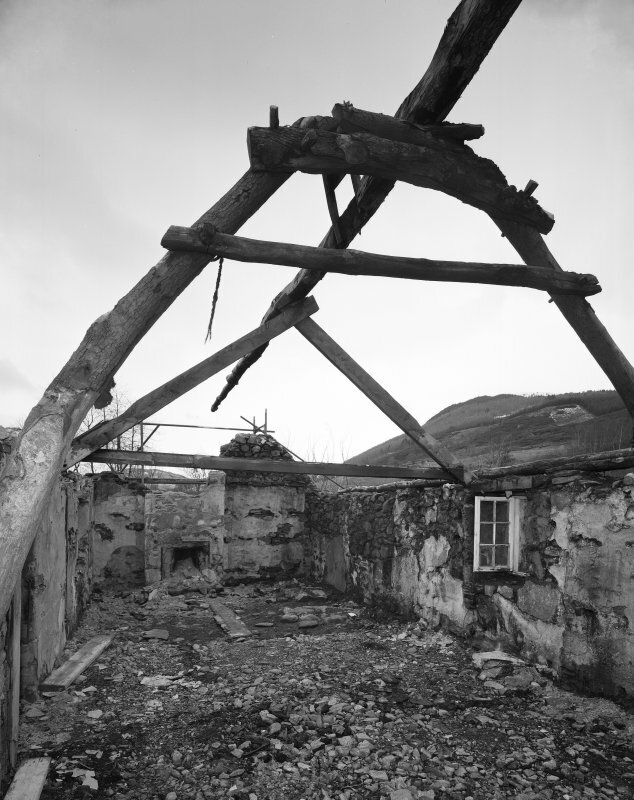 Detail showing three stages in cruck and later roof construction in cruck-framed byre; Fearnbeg. 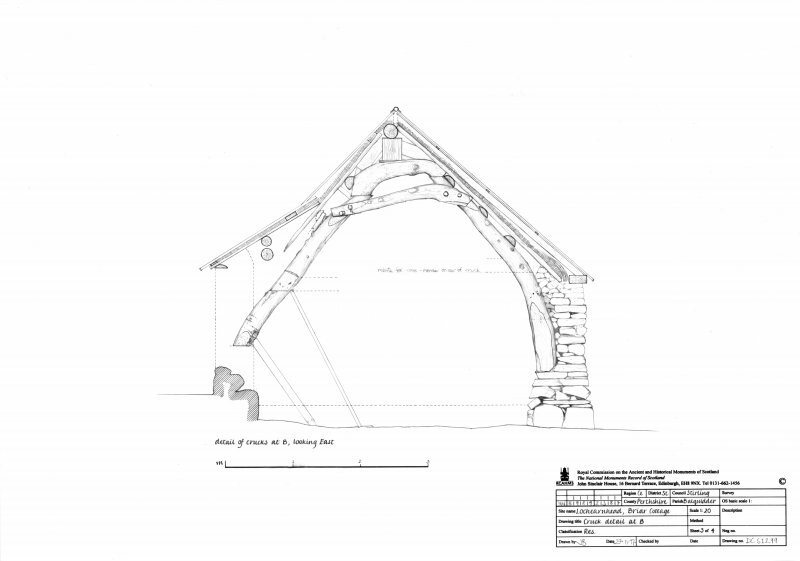 Detail of cruck truss in cruck-framed cottage, "Dwelling House C"; Cuaig. 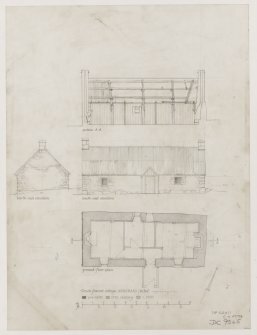 General view from South West of cruck-framed cottage - "Dwelling House C"; Cuaig. 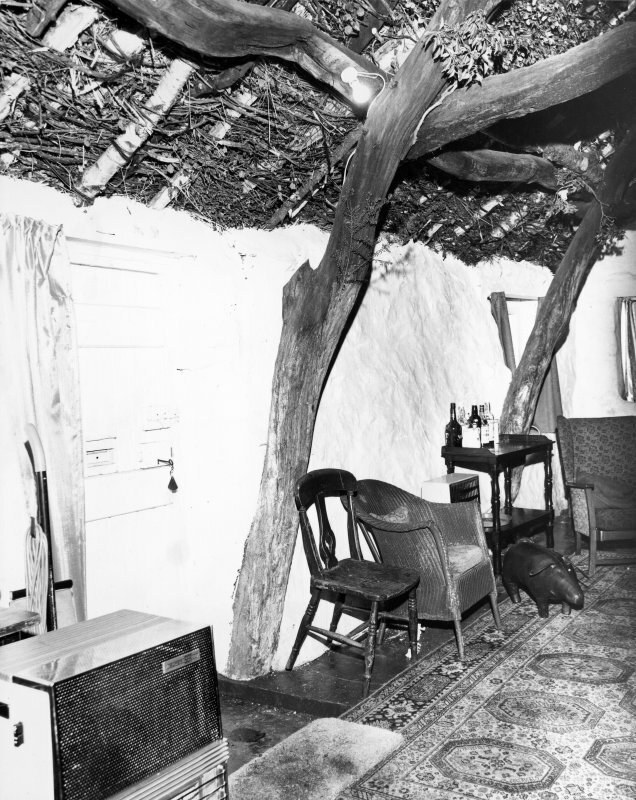 Interior view of cruck-framed cottage showing detail of east cruck in south wall; Wester Auchraw Croft, Lochearnhead. 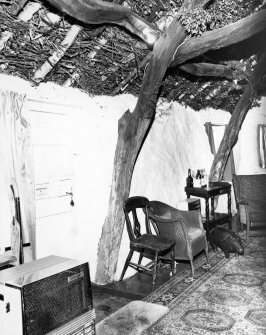 Interior view of cruck-framed cottage; Torthorwald, Dumfriesshire.